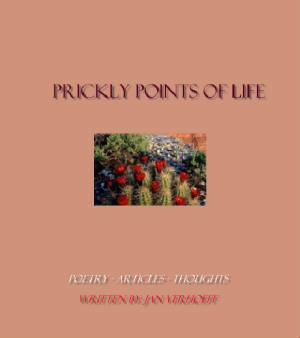 Welcome to Words to Ponder, the delightful home of "Prickly Points of Life", a remarkable collection of poetry, short stories, essays, and thoughts about life at a time when nothing comes easy, and beauty comes with thorns. Writers promote your work. Publish articles promoting your site, your work, or any specific thing you do on this site. Marketing development is up to you - just do it. Poetry, articles, and thoughts about life in the twenty-first century and beyond fill this book of inspiration. Jan profoundly describes life as a single parent, as a woman, as a child of divorce, as a mother, as a friend, and as a woman in love. She shares the depths of emotion from every aspect of her life in prose and in story. This is a book you won't want to miss out on!
" Say only what you mean. Use the power of your word in the direction of truth and love." While spring fills the air around my home with song, and summer brings warmth and love, family and friends, autumn colors my life with brilliance. My birthday is September 28th. For me, this signifies life and abundance, which magnifies the intensity of autumn colors and even of the harvest. I enthusiastically participate in autumn's bounty and look forward to winter's renewal and freshness. I love the snow! The wonder of hot spiced cider and hot cocoa, popcorn, chili, and wonderfully delicious comfort foods cooking in the kitchen always bring joy to my heart.
" Flaming enthusiasm, backed by horse sense and persistence, is the quality that most frequently makes for success." Share your views, opinion, and thoughts in my blog.